All I want to do is bicycle, bicycle, bicycle! From the magical harmonies to the various bicycle bells, Queen’s “Bicycle Race” embraces the simplicity and freedom of riding a bike. Summer in Minnesota is all about the bike. Adults remember the meaning of “it’s just like riding a bike”, kids learn to ditch the training wheels, and athletes enjoy speeding on open country roads. 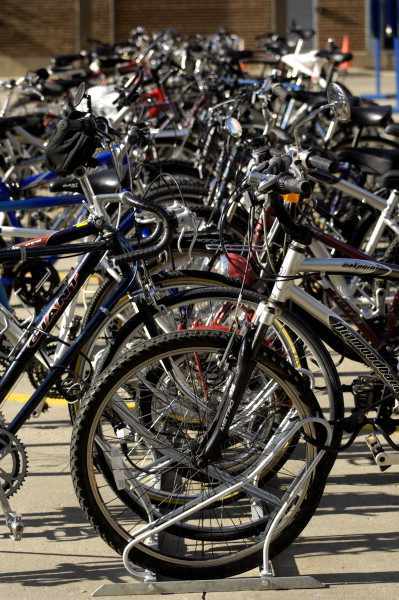 The tour de France wrapped up last week and commuter biking becomes popular again. It is generally easier to park your bike than it is to drive and find parking. A few years back I used to bike for speed and would quickly become annoyed when a family riding a buggy bike made for 4 would mistakenly come my way. Now, I am that family with the 2 kids on bikes, 1 kid in a wagon, and 2 frazzled parents. However your life may change and your goals with biking change, DAHLC is here for you. Check out our specific bike parking information, cycle studio class schedule (instructor-led and virtual), stationary bikes, small group training for strengthening muscles used while biking, and foam roller drop in classes and workshops for aiding your body in recovering after a long ride.